Using an all-star lineup of telescopes (Hubble, Spitzer, Keck and others), astronomers studying a very, very distant galaxy are making some surprising findings. 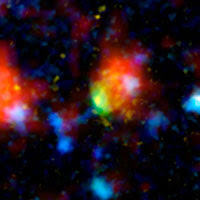 First, it's the brightest starburst-class galaxy discovered. Also, a NASA press release claims at 12.3 billion light-years away it's the most distant galaxy ever found (however, last year, Pound360 heard astronomers had found a galaxy 13 billion light years away… but what's a few hundred million light years at these distances, right?). Since the universe is only 13.7 billion years old, astronomers are observing activity just 1.2 billion years after the Big Bang. As if all that weren’t enough, this galaxy is cranking out stars like nothing scientists have ever seen: 4,000 per year. Our galaxy only makes 10 stars per year. At the rate of 4,000 stars per year, the distant galaxy would reach the size of "the most massive ones we see today" in just 50 million years (a blink on the cosmic timescale). The rate of star formation forces us to rethink what we know about how galaxies form. Conventional wisdom suggested galaxies grow by absorbing other, smaller galaxies (or stealing parts of bigger ones). But if galaxies can grow at 4,000 stars per year, they don't need to absorb anything to reach the sizes we're observing out there.